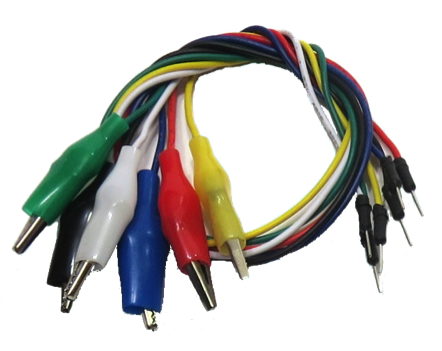 These are very special alligator clip cables that we have custom-made. They have an alligator clip on one end, and a pin on the other end to connect to the Arduino header sockets, the HyperDuino+R motor connectors, or even a standard breadboard! These are an essential part of any inventor's toolset! Click here for more information about the ally-pin and ally-socket cables. 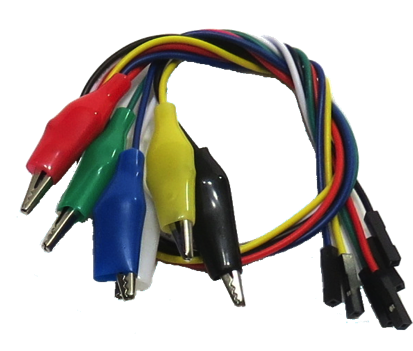 These are the complementary special alligator clip cables that have an alligator clip on one end, and a socket on the other end to connect to any of the pins on the HyperDuino or HyperDuino+R motor connectors. You can even match one ally-socket cable to an ally-pin cable to get a regular alligator-clips-on-both-ends cable.